We love the outdoors and being adventuresome, and many of our favorite books include some element of magic and mystery. So it makes sense that Zoo's story became our first Middle Grade novel. 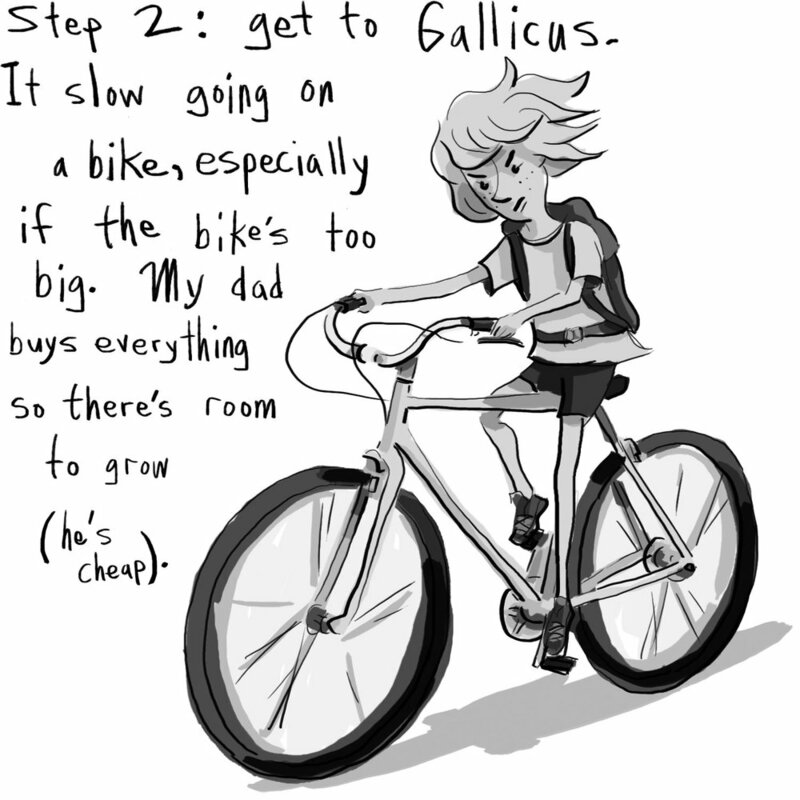 You might think we wrote this book because our kid was kind of like Zoo M. Slicky. But the truth is that it's based on Eric Zimmer himself. Impressive tantrums were his specialty. We'll tell you more about this...someday. But we did also write this story because we are parents. And like all parents, we struggle with the day to day tests of a strong willed child (don't all children have strong wills?). In other words, we definitely took advantage of parenting challenges and 1st hand experiences of stubbornness. Everyone can relate to explosive frustration, right? It truly is an attempt to describe how a boy comes to grips with the full spectrum of his character. The magical realism gave us a whimsical way of leading Zoo to the discovery of his true self. The story's exciting twists show how one’s perceived flaw can actually become one’s secret power. In the attic off his bedroom Zoo Slicky finds a key. Grandfather left it behind, wrapped in an ominous riddle only Zoo can solve. 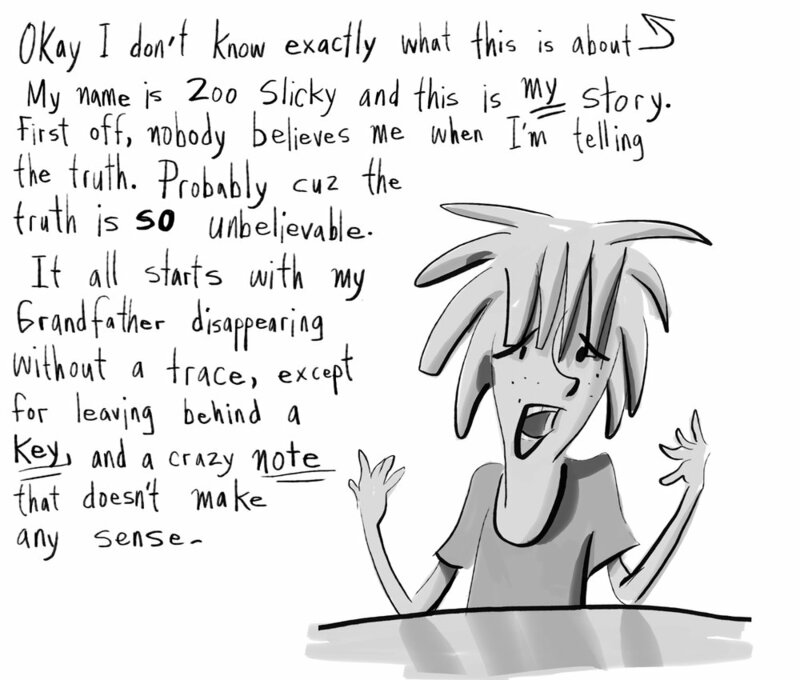 But no one ever listens to Zoo Slicky. Not about pizza, not about Grandfather’s disappearance. His dinner plate of stinky fish winds up splattered on the dining room wall and Zoo is sent to his room yet again. At eleven years old, if he doesn’t stop losing it, his parents will send him to boarding school for sure. The mysterious note leads him up Mount Gallicus, down wormholes, and ultimately onto Grandfather’s flying rug. With the help of his pals and faithful Winnie-the-Dog, Zoo uncovers a fiendish plot. Maybe his sister is right, Grandfather was smuggling ancient artifacts. Zoo refuses to believe it and uncovers a more likely suspect in a witchy old woman named Pyth. She knows Zoo’s grandfather and all about rug-riding, but won’t reveal anything useful. Zoo is desperate to make Grandfather’s tiger-rug fly but all his efforts fall flat. Finally, in the heat of the moment his anger proves essential. The rug takes off with Zoo flying by the seat of his pants. He gets the hang of it and flies clear across the world in pursuit of the mystery. Fierce tenacity and a brazen streak send Zoo and his two best friends on the ride of a lifetime. From the depths of a mine to the heights of the skies, narrow escapes and wacky clues carry the reader along for the ride. With fantastical elements and quirky characters, THE FREAKISH TEMPER OF ZOO M. SLICKY taps into a common struggle with anger. The action of the plot is driven by mystery and rug-riding, but the heart of the book lies in the transformation of a boy’s stubborn temper into his most valued asset, passionate determination.